Do you ever wonder why you need to clean and what is the point in doing the same jobs repeatedly? There are some great reasons why you need to clean but when you actually start to think about them in detail, it does give you even more motivation to clean your home and to keep repeating those cleaning jobs. Having a want to clean isn’t something that comes naturally for some people, they might see it as a waste of time, however, giving a reason can help to stimulate and motivate you to clean. When you think about leaving home and starting your own home, remember you will need to clean it regularly. You will need to do those same tasks over and over again. This repetition can cause some people to wonder why they clean, what purpose does it hold for them? Once I started looking for reasons to clean, there were more than even I could imagine and they are all great; however, I think the first one is the most important reason to clean! You need to clean for you, you deserve to live in a clean environment, you matter! This is often the most difficult reason to understand, you do deserve to live in a clean and safe environment and you are important enough to deserve a clean home and a clean place to live. When you become an adult, taking care of the environment where you live is part of growing up and taking responsibility for yourself and the home in which you live. The health of your family matters, keeping your home a clean and healthy place to live; this shows your family you care. You care about their needs and you want to give them a clean and healthy place in which they can live. If you love to clean and have a clean home, that is a part of who you are; having a clean home is important to you, embrace it but don’t let it ruin your life. When you clean, it gives you a sense of accomplishment and pride and that can just make you feel good! Cleaning can calm you down, you are not thinking about other things and you can focus on the task at hand, it is a great way to remove the stress from your life. Do you ever feel a sense of being overwhelmed when you think of your cleaning, you have so much to do and not the motivation to get up and carry out the tasks? Keeping on top of your cleaning can remove this feeling of being overwhelmed, it can put you in control, making you feel empowered to tackle what the day wants to throw your way. We all need a way to get rid of the stress in our lives and cleaning is a great way to manage it. You have time to do tasks, you can zone out of the stress, giving you time to unwind and take away those stresses that can cause illness and ill-health. Cleaning is a great way to exercise; you can get your heart rate to increase. Helping you to stay active and it completes the tasks quicker if you are enjoying the activity, try cleaning to music or set a timer to see how quickly you can clean. One reason why you need to clean is to prevent pests from taking over your home. If there is not a source of food, these animals will not have a reason to come into your home. If they do, they won’t stay if there is nothing they need. Keeping your home free of unwelcome visitors isn’t always easy but keeping your home clean might help deter those animals who stray. Cleaning your home is safe for your children. Exposing children to unhealthy living conditions can and will cause them health issues, which can result in the worst cases with your children taken into care. If your home is clean it is easier to find the things that you need, it means that you are not spending money on replacement items just because you can’t find something. Your home will be easier to clean the more frequently you clean, there will be less dirt and germs if you clean your home more; the time that it takes to get clean won’t be as long, giving you more time to do the things you love. A clean home is better for your mental health too, sometimes when we let the cleaning go for too long, it is difficult to see where you need to start and this can put you in a state of depression that becomes a vicious circle of not being able to clean. A clean home means that you aren’t embarrassed to invite your friends or family over, it gives you a sense of freedom to enjoy your life and living in a clean home can help promote that sense of pride in the place you call home. Cleaning is a way to bring order to chaos, it is about putting things right, it gives you a sense of accomplishment but it also gives you just as much back because you take back control of your home. By cleaning your home, you are showing your family that you care; you care about their health and their well-being. It is a way to say I am thankful for you, I want to show that care by keeping our home clean. Your home is where you live if it is clean it will feel good to you, it’s a place you call home, where you live. If you keep it clean, you are giving yourself love and showing you care about you, which is so important. Looking for a reason to do those jobs and cleaning tasks on a daily basis can help reducing the need to question the practice. It is something that you will need to do for the rest of your life; it is a part of being humble to yourself, not thinking that you are worth more than the next person. 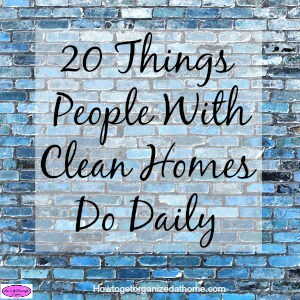 An article I wrote recently on 20 Things People With Clean Homes Do Daily highlights how sometimes you can clean less instead of more and make a great clean home! Cleaning has that power to bring you back to the realization that what you need to do to keep your home clean is the same as the next person. How much you clean is a personal preference, but not giving yourself that understanding of the importance it holds for you and your future self. It teaches you the ability to take on tasks that aren’t as important for the future of the world, but to tackle them with the same intent as to the importance they hold for you and your family. Therefore, why you need to clean is a multitude of different reasoning’s, some are stronger than others are, but what is the most important element is that you and your family deserve to live in a clean home. The reason you pick to motivate you to clean isn’t as important as actually getting up and cleaning your home. My favourite product for cleaning is microfiber cloths, they are my go to cleaning product and they are easy to wash and clean! What is your motivation, why do you need to clean? Extremely interesting article! I love my home to be clean and by reading those reasons to clean I feel more inspired to do it. Thanks for the great post! Clutter, dust and disorder have a sneaky way of migrating through a home. We are in the midst of a bathroom renovation and somehow this has disrupted every room in the place. It’s a temporary situation but very demoralizing. How a dismantled guest bath turned into a dirty refrigerator is a mystery; my husband is doing 90% of the remodeling work so I don’t even have that excuse!